According to Brenda Wickenhauser, territorial sales representative for Bailey Nurseries, Minnesota presents special challenges for growing roses. Minnesota's cold, dry winters are especially hard on roses and it takes a special breed of rose to thrive, if not simply survive, here. In northern climates, some roses don't return year after year, and sometimes they lose their fragrance. And, because of the stress of hard growing conditions, roses are susceptible to diseases. Plants must be hardy and disease resistant in our climate. Bailey Nurseries, in Newport, with nurseries in Oregon and Washington, is a wholesale grower of roses and other plants. They supply local independent garden centers, such as Otten Bros. in Long Lake, with plants that are specifically bred for northern climates. There are thousands of varieties of roses, each adapted to unique geographic growing conditions. Arguably, no other flower is as popular in the world; songs, movies and poems are written to extol its beauty. It is the symbol of romance and love worldwide, in spite of the thorns on its stems. But only a few - less than a dozen - of the thousands of varieties are specially bred for northern climates, Zone 4, to resist disease and dry, cold weather. Zone 4 includes the northern portions of the United States, Europe (Sweden, Finland, Norway), and Asia. Rose growers learned these facts and more at a recent "appreciation" event at Otten Bros. Nursery and Landscaping in Long Lake. More than 50 people attended the event, which was designed to "pay our friends and customers back," according to Kris Uter, an Otten Bros. representative, "We wanted to thank them for what they've done for us over the years." It was the first event of its kind in Otten Bros.' 100-year history. Among those invited were customers who had shown a special interest in roses, longtime customers and friends. Ping Lim, rose "hybridizer," was the featured speaker at the event, coming here to introduce "Easy Elegance," a collection of roses that he described as "a new era in roses." The collection can be used in mass planting, to define borders or potted in large containers to decorate entryways or patios. Laotian-born Lim was inspired to study floriculture by the beautiful roses growing in his native land's highland plateaus. He attended college in Taiwan, earned a degree in horticulture and immigrated to the United States in 1980. Since 1992, Lim has been the Rose Research Director for Bailey Nurseries, and twice has won top national awards from All-American Rose Selections (AARS), an organization comprised of growers who are dedicated to "the introduction and promotion of exceptional roses," according to their Web site, www.rose.org. Lim pointed out with pride that Minnesota selected one of Bailey's roses, the "Centennial," for the state Capitol's 100th anniversary. He also developed "Forty Heroes," roses that honor the firefighters who died in the 9/11 attacks on the World Trade Center. Prior to focusing their efforts on breeding roses specifically for northern climates, some rose growers tried to adapt roses for this area by grafting rose buds onto the vigorous roots of other rose plants. 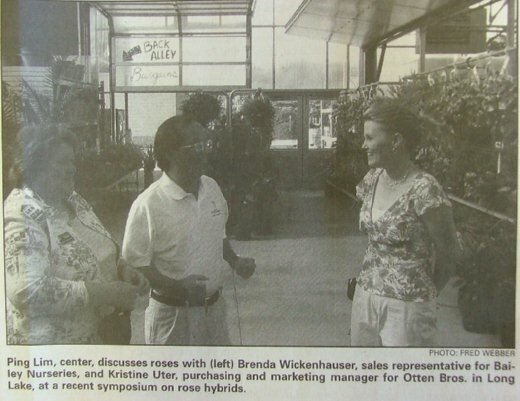 Roses specially bred for an area are called "own root roses," said Brenda Wickenhauser, territorial sales representative for Bailey Nurseries in Newport. Bailey Nurseries is a wholesale grower, supplying plants to independent garden centers such as Otten Bros. Wickenhauser advises customers to look for those words on packages or tags. "Own root roses may take twice as long to breed," she said, but they will continue to grow well throughout the years, where others may not survive. "Bailey Nurseries work with independent garden centers, such as Otten Bros., Wickenhauser said, "because they are the places for consumers to go when they need accurate information and personal attention." Jonathan Pedersen, Bailey Nurseries' marketing director, said, "No one in the world is as passionate about roses as Ping. His passion comes through when he talks about roses. He's not a botanist, he's a rose lover!" Lim described the 10-year hybridization process Bailey Nurseries follows. Breeders make "crosses," transplanting pollen from 25,000 plants. From these, more than 250,000 seeds are collected, which germinate into plants from which only one or two desired plants will be selected. When explaining the unpredictability of the breeding roses, Lim told a story of a gorgeous young woman who approached the elderly Albert Einstein and said she wanted to marry him. When he asked her why she'd want to marry such an unattractive old man, she said she wanted to give birth to a beautiful genius. Einstein reportedly said, "But what if he's ugly like me and dumb like you?" "Why," Lim asked, "would we want to breed another rose [with so many already available]? "Because," Lim said, "Minnesota presents an almost impossible mission: breed a rose that is hardy, returns every year and is fragrant." Citing Minnesota's "ice box weather," he described the state's winter climate as "harsh," and pointed out that "cold winters dry roses out." He said the weather is "not as bad on the coasts, where winters are moister. Plants dry out, just as people do, during the winter with low humidity. Minnesota isn't just cold, it also has cold snaps. Just when you think winter is over, it comes back." John O'Reilly, manager of Otten's Garden Center, pointed out that roses bred for this part of the country don't need special winter protection. "No need for the 'Minnesota Tip,'" a practice in which rose plants were tipped on sides and covered to protect them from winter, he said. Lim wanted to develop roses that can be planted and almost forgotten, requiring very low maintenance. Lim said he sees his task "to make roses look good without chemicals." He wanted rose plants that were chemical free, "because we must have a clean environment, too," he said. The greenhouses in Oregon where the roses are bred have no roofs, Lim said, "because we invite disease in to find out how to fight it." He calls disease resistance the "'kiss me' effect . . . if you have a disease, no one will kiss you." Why breed roses in Oregon? Oregon has more than 50 inches of rain annually. High moisture levels contribute to "black spot," a disease that turns rose leaves yellow, causing them to fall prematurely. "So," Ping said, "We breed to resist it." Lim defined the "perfect rose" as having "Chi, the internal energy life-force." "Everything fits together: color, hardiness and fragrance," Lim said. In talking about the "Easy Elegance" collection, Lim modestly stated, "We make the roses easy - they are already elegant." "Many people feel roses are too much trouble to grow and keep looking good," Lim said. "People see roses as needing special care. But, that's not true when the roses have been specially bred [for Minnesota's climate]. People shouldn't be afraid of roses." He said Easy Elegance, bred for Zone 4, is well suited to Minnesota because, "they can take the cold and are disease resistant." He closed his presentation by saying, "The world is our garden. It's not a dream . . . it is our mission."